Amazing Man, Amazing Documentary---"We are all one." I was riveted as I watched this one. 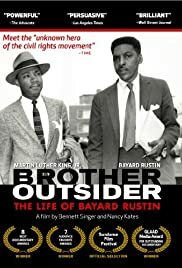 From the perspective of the 21st century, it is hard to understand why Bayard Rustin was pushed to the background by his fellow civil rights leaders just for being gay. And yet, I remember a time when there was no room for women's rights and gay rights in the civil rights movement. This documentary should remind all political activists that divide and conquer is their enemy's favorite tool. And once you allow your group to be divided, you will be conquered. The footage of Mr. Rustin through the years is the best part of the documentary--which is how it should be. If you are telling the story of someone's life, your subject should be charismatic enough to catch the viewer's interest all by himself. And Rustin certainly was charismatic. And so eloquent! It is refreshing to see a political leader who talked sense without trying to dumb down the truth. Reminded me a lot of Tom Paine, another great American who was not afraid to fight the big battles.